Doctor Who: Revisiting THE CAVES OF ANDROZANI | Warped Factor - Words in the Key of Geek. Feels different this time, says Tony Fyler. Every time the Doctor opens the doors of the Tardis, there’s the potential for wonder, for splendour, for excitement – or for death. The danger inherent in just being the Doctor, or being his companion, is rarely better exemplified than in the story which has regularly topped fan lists as the best story of the last fifty-one years, The Caves of Androzani. We guess from the easy banter of Peri and the Doctor in the opening scenes that they’ve been together some time since Planet of Fire, and that really, they’re only here to pick up some sand, to blow some glass, to build a new component for the Tardis. There’s sand all around them, but the Doctor spots something that piques his curiosity – two sets of tracks in the sand. If they’d stopped there, picked up their sand and sodded off, the Fifth Doctor would have had, possibly, a much longer life, and Peri would have had in all likelihood a much easier one. But no. That’s not the Doctor. If there’s been a single defining characteristic in his 51 years of screen/book/audio life, it’s been his curiosity. 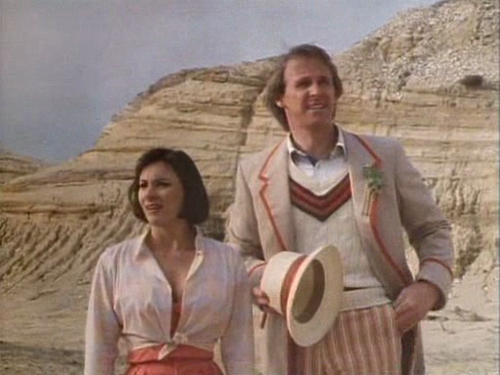 And so he and Peri follow the tracks into the nearby caves (or blowholes if you insist – The Blowholes of Androzani? ), and their luck runs rapidly out. 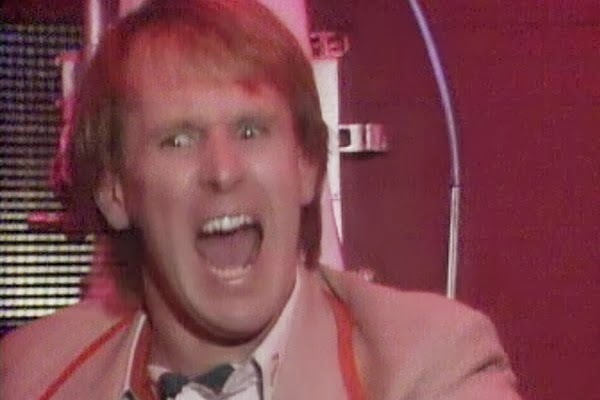 Robert Holmes was the master of writing engaging, usually humorous secondary characters, but over Peter Davison’s time, Eric Saward had been snapping at his heels, writing detailed, layered secondary characters with a generally more miserable or unpleasant outlook. The Caves of Androzani feels like Holmes rolling up his sleeves and taking on the young whipper-snapper at his own game. There appears to be nobody even remotely pleasant on either Androzani – Major or Minor - and the Doctor and Peri are buffeted about like pinballs in a maze of politics, double-cross and boiling hatred, from Stotz and Krelper the mercenary gun-runners, to General Chellak and Major Salateen, embattled, put-upon and facing an implacable foe in battle and an impossible perception-war back home, to Sharaz Jek, the technical terrorist and creepy Phantom of Androzani with his non-judgmental androids and his fetish for Peri’s beauty, to Krau Timmin, the sophisticated secretary, and Trau Morgus, the despicable, high-functioning sociopath at the heart of the web of spectrox supply and demand for the whole of Androzani Major. Spectrox is the most valuable substance in the galaxy, being in its refined form, an elixir of life and vitality. In its raw form (in itself something of a satirical idea), this elixir of life is utterly poisonous and fatal, meaning control of the supply chain is vital. The fact that Holmes weaves a ghastly, dark web around such a substance, eschewing utopian ideas of universal peace and wisdom among people who can live much longer lives than nature decrees gives a horrifying realism to the scenario in which the Doctor and Peri find themselves – quickly encountering raw spectrox is bad enough, but being bounced from one group of disagreeable thugs to another gives the whole atmosphere of The Caves of Androzani a darkness that’s less funereal than it is jittery – clearly neither Stotz nor Chellak will scruple to shoot them for what they each assume their part in their ‘pathetic local squabble’ really is. And that’s the other element about The Caves of Androzani that gives it its encroaching gloom and its claustrophobic atmosphere – the Fifth Doctor, scourge of the Daleks, enemy of the Cybermen, able to foil the plots of the Master, one of the greatest criminal masterminds the universe has ever seen, gets caught in what really is a very small, very local dispute over a substance in which he has ultimately no interest whatsoever. It’s the sheer smallness of the Androzani conflict that feels like a heavy weight, compressing all the rivalries and hatreds, all the armed struggles and the political chicanery into a diamond point of irrelevance – but still, caught between the devils and a sea of superheated primeval mud, it’s the events of Androzani that push the Fifth Doctor to his breaking point. That’s because the Doctor’s particular skills – extreme cleverness and the gift of the gab – are of no use on Androzani. No-one wants to listen to his tales of innocence, everyone on the worlds of Androzani is too jaded, too exhausted to care – another darkly satirical thread in a story about a substance that guarantees rejuvenation and vitality. There’s also a rather grown-up hardness to the dilemmas of Androzani – Spectrox toxaemia is a fatal disease which marks the cards of both the Doctor and Peri early on. The gun runners have a bluff edge but feel sharp as need underneath, a lean script of dialogue suiting Maurice Roeves as Stotz in particular, with Roy Holder’s Krelper a more straightforward thug. Their predictable turning on each other adds weight to the idea that no-one is safe around them. Christopher Gable’s Sharaz Jek gives a convincing air of the one-time sun-dwelling sophisticate driven to a life of twisted subterranean loneliness by self-loathing and a bile-fire hatred of Morgus, the double-crossing sociopath who – unknowing or uncaring – has become the focus of Jek’s one man campaign against society. His whispering and caressing of Peri, uninvited, take us into uncomfortable areas for Doctor Who, and Peri’s cringing reactions show us in no uncertain terms that these are adult touches and adult issues with which she’s having to cope. Chellak and Salateen are the epitome of exhausted, out-of-options soldiers, underappreciated, understaffed, and underfunded, with the weight of a world’s expectation on their shoulders. 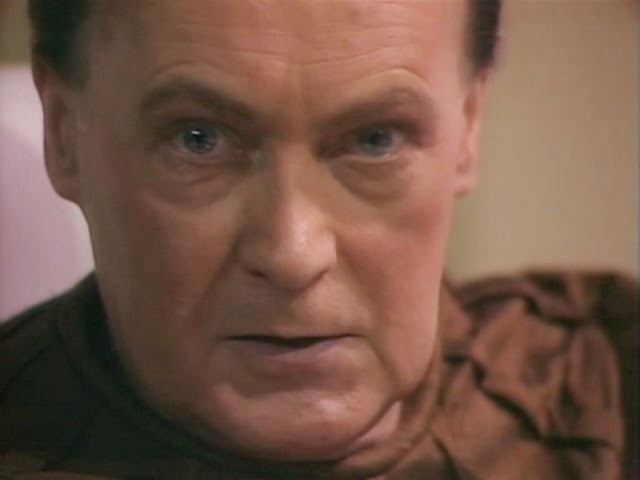 They’re initially quite prepared to execute the Doctor and Peri, more because it would get rid of one more problem – the straw that could break their backs – than because they bear them any special malice. And then there’s Morgus. Morgus the fat cat, whose mind is staggeringly lean and linear, who murders the President of Androzani Major for the merest suspicion that the old man will interfere with his plans – and then orders a lift maintenance engineer shot to cover up his part in the crime. Holmes’ leanness of script, the massive unpleasantness of everyone the Doctor and Peri encounter, the oppressive smallness of the dilemmas and the inescapability of the pinball from one odious character to another make The Caves of Androzani an exhausting watch – but also one from which you can rarely turn away. Added to Holmes’ script, Graeme Harper’s downbeat, claustrophobic direction and the fact that there’s not a single performance in the relatively small cast that’s less than superb make Androzani stand far, far above much else in 80s Who. Maurice Roeves and Roy Holder give a hard knife-edged reality to Stotz and Krelper. Christopher Gable oozes the creepiness of beauty corrupted, and John Normington as Morgus – especially in his apparently unscripted and accidental turns to camera – delivers a sociopath that can still chill an audience to this day. But perhaps, more than all of this, what makes The Caves of Androzani so beloved by Who fans more than thirty years later is the lack of moral ambiguity it delivers. 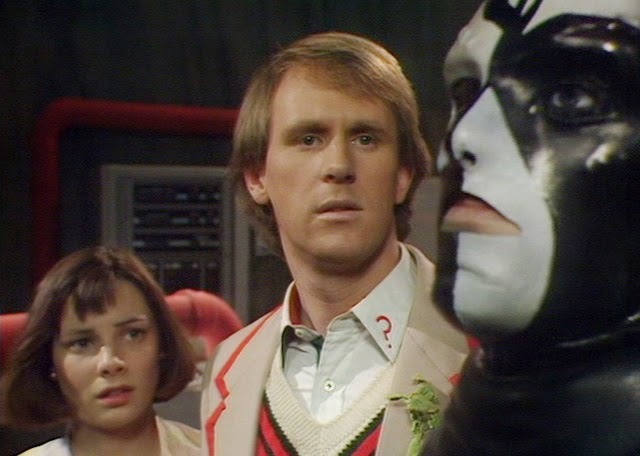 When everybody is as bad, as morally jaded as they are on Androzani, the Fifth Doctor simply being the Fifth Doctor shows up the purity of his heroics. His determination to get the bats’ milk which is a cure for spectrox toxaemia drives him for at least half the story to hold off the peace of death or the rejuvenation of regeneration, crashing spaceships, running and crawling into complex, airless cave systems, outrunning mudbursts and homicidal mercenaries simply because he feels he owes the effort to Peri, for having got her involved in this small world and its pathetic problems. When he succeeds, and then realises his last minute stumble means there’s only enough of the bats’ milk for her, there’s something broken in his eyes and face, something hopeless but unthinkingly generous. He saves Peri without a second thought and lays down on the Tardis floor, unsure whether he will die, or whether regeneration will save him. Either way, for this Doctor, we get the sense that it ‘feels like death’ and that he’s done all that he can. Having been ‘born’ with a sense of disappointment in what he got, he’s been the best Doctor he has been able to be. As the swirling battle for his future plays out in his mind, it’s more the rage and laughter of the Master than the encouragement of his friends that spurs the process on. The Fifth Doctor, more in his final adventure than in any other, has been a Doctor stripped of affectation, of pretension and of any smart way out. It’s Androzani that forces the Fifth Doctor to be more than clever – to be heroic. That’s why it’s so beloved – it shows the Fifth Doctor that might have been, and that along the way sometimes was, distilled to his purest, simplest heroic form.